During her last year of high school, Nastja went climbing for the first time; the experience captured her heart and she was hooked. While studying physiotherapy at university, Nastja joined the Slovenian Alpine Club and spent every free minute rock climbing and mountaineering. After graduation, she earned her climbing instructor qualifications, and today she travels around the globe in search of difficult climbs that push her limits. 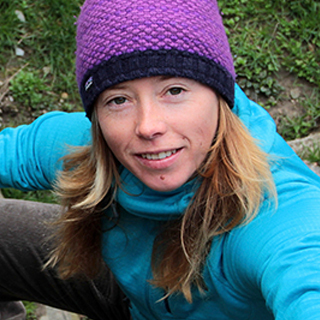 She enjoys sport, trad, big wall, ice and mixed climbing year-round and has taken part in many expeditions, including three with all-female teams, and climbing trips to Patagonia, the United States, Kyrgyzstan, Nepal, Alaska and India. When she’s not playing in the mountains she works at a local climbing school, where she helps train climbers of all ages. Received award for the best woman alpinist of Ljubljana for the last six years. 2004 All-female-team ascent of Aguja Guillaumet, Amy couloir (5, 60˚, 450 m), Aguja de la S, Josh Alke (6+/4-5, 450 m), Patagonia. 2007 Ascents of Ak Su, Slesova (4,240 m), Perestroika Crack (5.10, A0, 900 m), Central piramid (4,380 m), NW pillar (5.10c, 900 m), Piramid du Pamir (3,605 m), Lost Mountain (5.10c, 600m), Nad bazo (5.10b, 400 m, first ascent), Kyrgyzstan. 2015 First ascents of three previously unclimbed peaks: Khumchu Ri 6,064 m, Kun Long Ri 6,058 m (V+, TD+, 70°, 1,500 m) and Ri Pok Te 6,210 m (TD+/ED-, VI-, 1,200 m) with Matija Jošt, Raru Mountains, Zanskar, India’s Himalaya.